So what is ‘archiving’ in the context of MDaemon? An MDaemon archive refers to a copy of an email that is taken as soon as it accepted at the server. The archive process does not change the message that is received in any way and it does not alter what is in the users mailboxes. The original message is delivered as normal. This means that on its own the MDaemon archiving feature will increase the storage requirement for MDaemon mail significantly – in effect all mail is kept twice. It’s also worth noting that the archive can only copy new email from the point the option is enabled, it will not include old messages that the user may already have in their mailbox. There is a separate ‘Account Pruning’ process in MDaemon that can be used to periodically delete old email from mailboxes, but this process does no checks to see if the mail is also in the archive so is no linked in any way, and should be used with care. In contrast, a dedicated archiving solution like MailStore Server will keep a copy of all email that exists across multiple mailboxes, public folders and from different sources and can also be used to prune specific old email that it knows exists within the archive and can be safely removed from the mail server to free up space (more about this later). There are two different methods in MDaemon for archiving email. This option is a very basic archive and simply takes a copy of email and sends it to a different email address ( local or remote). If you choose to use a local MDaemon account to forward email to, it’s worth noting that this mailbox could grow very quickly and would contain all inbound and outbound email in the inbox. This can be very difficult to open and search through and it’s possible to quickly reach a huge volume of messages and, therefore, file number limits can be an issue. As a result, we don’t generally recommend this method of archiving. The next development in MDaemon Archiving was to use the Public Folders to store the archive. The main advantage of this approach was that separate archive folders were created for ‘Inbound to’ and ‘Outbound from’ email. There is also an option to subdivide these folders by the Recipients and Senders so it becomes easier to look for a specific MDaemon users archived email. This method helps keep the number of messages per folder lower, but for users who receive a lot of emails, each folder can still contain a large number of messages and file limits can sometimes be reached. Unfortunately, the disadvantage of storing the archive under the public folder is the effect accessing the archive can have on the performance of the public folders. For large archives, users accessing other public folders could see timeouts while a users archive was being accessed due to the increased disk load it creates. Due to the way MDaemon manages public folders the archive could not be separated and stored on a different disk to help with this issue. With the release of MDaemon Version 16, a new archiving method is replacing the public folder approach. 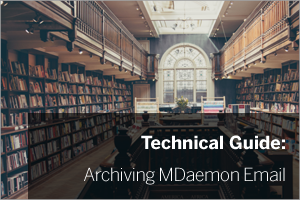 Instead of storing the archives under a public folder the archive can now be created within a specific folder on the MDaemon Server (Default is \MDaemon\archive\email\). Separate subfolders for ‘In’ and ‘out’ emails are created per domain. These can also contain a separate folder for each sender/recipient as appropriate. So in a lot of ways, this is similar to the existing method apart from the folder is not part of the public folder tree. Sharing of the archive can be achieved but requires an additional MDaemon account mailbox to be setup to use the archive folder as the mailbox folder for the account. If upgrading from the previous version of MDaemon the existing public folder archive will not be migrated and remains dormant. This could be merged but would require some work to rename folders, etc. Sharing of the archive could be done using folder sharing or giving multiple access to mailbox details. If the archive is accessed directly using the MDaemon account it would be very easy to accidentally delete data it contains. MDaemon only archives messages sent ‘to’ your local users or sent ‘from’ your local users. Messages just relaying through the server are not archived by this simple system. Virus and mailing list messages are not archived. Messages are only archived after all content filters have been applied so the archive does not necessarily represent the message that was received, but rather what was delivered to the internal user. When upgrading to MDaemon version 16 it is advised to remove the old Public Folder archives that may be left behind from a previous version. However, it has been found that if you do this, the Outlook users that have previously been configured to view these archive folders can be triggered to send an ‘unread’ notification message to all emails that were present in the archive folder, that had read notifications enabled. This is an Outlook feature that is designed to alert senders if the message they send is not read and simply deleted, but as the copy in the archive may not have been read this could potentially trigger 1000’s of notifications on deletion. How to disable these notifications depends on the version of Outlook being used. For example, in Outlook 2013 the setting is at “Tools|Options|Preferences|E-Mail Options|Tracking Options – Never send a response”. Re-enable the notification settings in Outlook if required. This only need be done for Outlook users with access to the Mail Archive public folder. Moving forward, MDaemon will detect and strip out the header(s) which trigger Outlook to behave this way (but only from archived copies of messages). For each method of email archiving within MDaemon, the archive was simply a copy of the email at best and this would duplicate all messages. This simple approach can be useful if that all that is required but it’s not by any means a fully functional archiving solution. Archive messages as soon as they arrive (Journaling) or archive existing mailboxes or both to meet archive compliance requirements. Preserve full mailbox folder structure in the archive. End users can only access their own archive by default. Easy access control to allow users to view other archives. All archived email is de-duplicated and compressed (typically 50% of MDaemon). Delete ‘old messages’ from MDaemon user mailboxes greatly increases MDaemon user mailbox performance. Archiving of public folder email can be separated and folder structure kept. Powerful server-side fast searching across archive, including options such as ‘Search for text withing attachments’. No limits on archive size. Archives can be stored on local drives or network shares. Multiple storage containers created allows storage to span multiple disks and network shares if required. Dedicated Outlook Add-in to allow users to quickly access and search for messages in the archive. Separate Web interface for mobile access to archive including small screen layout optimized for smartphones. I hope you found that useful – please feel free to drop any comments or questions below..